AlphaCard Blog - What are my ID cards made from? The ID cards and badges you print on your ID card printer look great, but have you ever wondered what the cards are made with and why those materials are important to card durability? We’ve got your key to understanding ID cardstock materials. Standard ID cards are made from a durable PVC plastic – this popular and common material means you can get cards in a wide range of sizes, colors, and styles for the most options when printing ID cards. PVC cards are designed to withstand daily wear and tear, but will bend and break under pressure. Because the lamination process requires a card to withstand more heat from the printhead during the printing process, you’ll need to use PVC/Poly composite cards instead of a standard PVC card. This combo material is designed to withstand the higher temperatures without warping so your cards will come out looking great. 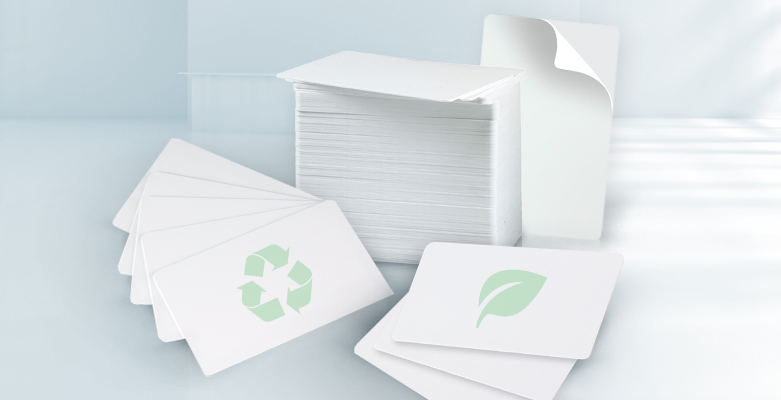 Both options offer the same durability and quality of standard cards with less of an impact on the Earth. Additionally, plastic ID cards come in different thicknesses and colors. Learn more about ID cards in the AlphaCard Learning Center. By Keisha|2019-02-08T22:09:00+00:00March 3rd, 2016|Ask AlphaCard, Blank Cards, Product Spotlight|Comments Off on What are my ID cards made from?